This essay explores the background and context to the project “Dumb Type – the birth of new media dramaturgy.”1 My colleague Fujii Shintarô and I had often discussed the fact that dumb type’s (lower case by preference) performances were widely seen around the world and received much acclaim but there remained a need to gather diverse critical perspectives on their oeuvre. This is especially so given that many company members are now working independently on a diverse range of projects. We saw a particular need to explore dumb type’s pioneering suite of multimedia performances pH (1989), S/N (1994), OR (1996–7) and Memorandum (1999–2000) as the basis for an emergent transformation in performance towards the development of new forms. Their astonishing advance of performance aesthetics and techniques of presentation in these works, using intermediality, immersive experiences of sound and visuality, and their combination of postmodern dance and personal confession with the politics of globalisation, constitute a move towards, what we term here, new media dramaturgy (NMD). Founded in 1984 and very active until the early 2000s, dumb type developed performances, art installations, community forums and cafes with the aim to interweave art, politics and daily life. Their work was well known and toured to many cities around the world; they were perhaps the first globalised performance group to emerge from Japan. Our provocation is that dumb type’s work was at the beginning of a new interweave of media technology, live performance and cultural politics, and, hence, is an important yet to be addressed foundation of NMD, a genre of performance that is now ever-present in various forms. Here, I will discuss the idea of NMD in connection to dumb type and outline some of the thinking that applies to the concept of interweaving performance cultures and new media. 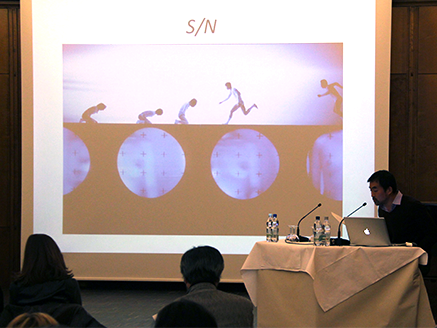 In describing dumb type’s work as a critical art practice, Asada Akira has provided us with many memorable statements. Among these, his description of their performance of Memorandum as “information integrated in the extreme, [and] cancelled out, close to absolute zero”2 is helpful also in thinking about a project that might attempt to show the diversity of dumb type’s work. In short, we are dealing with a remarkable complexity and diversity of work that in many respects can only be abridged by processes of categorisation. It is work that is cerebral and also kitsch, it combines advanced and simple technology, it is about utopian politics, collective activism and, also, about subjectivity, individualism, uncanniness, aesthetic failure, and death. Information is gathered and cancelled out in a flow of mediatised image-based performances that stimulate sensory organs and activate mind and body even while these performances can have the effect of overwhelming us and erasing our sense of embodiment and selfhood. There are many images of bodies falling into space in their work, also moments showing bodies blending with visual images, or temporal disturbances that change how bodies are seen. One feels like one is diving into the techno-sublime aesthetic storm of informational flow and new media imagery. In fact, this idea was literally enacted in Memorandum in a scene showing a performer in a bathing suit preparing to dive into a pool, reinterpreted as a screen of intensely pixelated image-data, rapid fire projections and static feedback. Spanning some 22 years, dumb type’s work runs alongside extraordinary transformations of media, technology and the rise of postmodern tendencies in live performance. 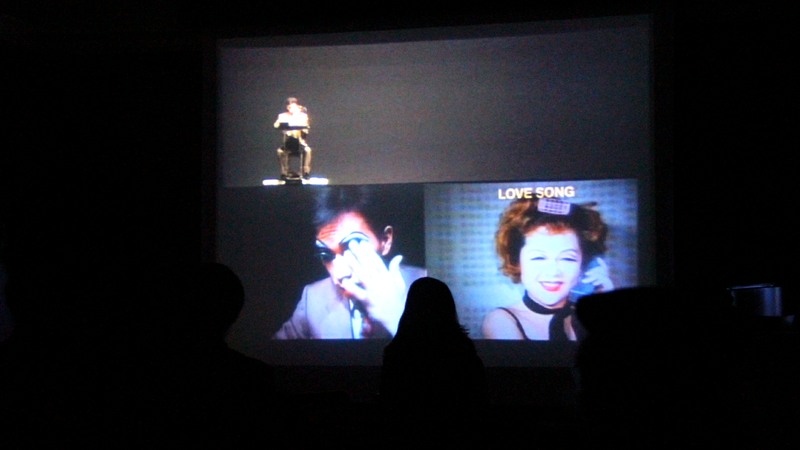 Digital technologies transformed the production of live performance during the 1980s and 1990s. These developments included the widespread use of computer operated lighting systems, sound sampling, digital projection and the use of live video feeds projected onto screens, bodies and stage surfaces in real time. With these technologies often being adapted and repurposed, and with regular breakdowns, this was often a white-knuckle experience in the context of live performance; especially so, for companies lacking resources and dedicated performance spaces. Despite their high technology aesthetics, dumb type had small budgets and drew extensively on collective unpaid labour. For example, Fujimoto Takayuki, lighting designer and technician for dumb type, recounts how they had to invent electrical switching systems and find ways to make computer printer ports (the only output in early computers) communicate with stage devices.6 At the same time, technological environments became increasingly complex as digital technologies in theatre broadly followed developments in personal computer hardware that was rapidly becoming more portable, more powerful, more reliable and cheaper and easier to use. Along with these developments, the cultural upheaval of postmodern thinking as elaborated by scholars such as Jean-François Lyotard and Jean Baudrillard is both an influence on dumb type and is sometimes used citation-like in their performances. As is well known, postmodernism was transforming the humanities and art worlds of the 1980s. Lyotard’s The Postmodern Condition: A Report on Knowledge, published in French in 1979 and in English in 1984, presaged the introduction of the concept of the informational economy and showed how knowledge was becoming interdisciplinary and mixing aspects of science, history, politics and art.7 Baudrillard’s Simulacra and Simulation, published in French in 1981 and English in 1994, radically transformed our understanding of the experience of live performance with the introduction of his thinking about virtual states and hyperreality.8 While dumb type members were, generally speaking, not theorists, their publications that accompanied performances and art events would often make use of postmodern critical essays in English and their live works introduced postmodern discourse through the projection of texts as well as through postmodern imagery in shows such as S/N and OR. While a longer discussion of these themes is beyond the scope of this essay, I mention postmodern and digital technology because they converge in this era and it is this factor, and the ways that convergence is expressed in dumb type’s work, that is of great interest. For one thing, convergence is essential to the theme of NMD and, hence, our interest in how NMD is fostered in the work of dumb type as a point of departure for this project. Helena Grehan, Ed Scheer and I have been developing the concept of new media dramaturgy to investigate the transformations underway in live performance in relation to new media. We define NMD as a turn to visuality, intermediality, and dialectical moves in performance that show these expressions embodied and visualised in live performance space and time. We are interested in how these expressions might be understood compositionally and dramaturgically.9 Like dumb type’s work, this is a field of performance in between theatre, dance, music and visual arts. We focus on the key word dramaturgy. Understood as a transformational, interstitial and translation practice, dramaturgy bridges ideas and their compositional and embodied enactment. NMD is the name we use to designate both the composition of this kind of performance in and through new media art works, and its effects on an audience. I borrow from Homi K. Bhabha in developing “interstitial perspectives,” that broadly are intended to focus on points of intersection in theatrical form. These are like nodal points wherein an idea that motivates an art work overlaps with its chosen mode of creative expression. Similarly, performance itself interweaves with the everyday and this too, in Bhabha’s terms, is a way to develop interstitial thinking.10 Elsewhere, I have called this “an expanded dramaturgy” to describe a theatre that is always showing in the production of art, the dramaturgical idea and trace of its process.11 This is a dialectical process of creativity in which dramaturgical awareness is communicated to the audience as an aesthetic effect. The reproduction and intensification of the image that becomes virtualised in so many of dumb type’s works grounds the idea of an image machine and this inevitably extends into an interstitial form of dramaturgy. This in turn bears comparison to the notion of interweaving performance. Interweaving performance begins with an aim to shift the discourse of intercultural and postcolonial theatre studies into a new cultural political context, one that is cognisant of the significant transforming effects of globalisation. In conversation with Holger Hartung we began to wonder how the concept of interweaving extends beyond identity practices and into questions about mediatised, hybrid and interdisciplinary forms of performance. In this sense, interweaving is not only a formation to reflect on cross-cultural flows in theatre, but is also a method to describe the interactivity of technology and media domains in live performance. Moreover, to consider how dramaturgy relates to this situation suggests the need to think more clearly about how our assumptions about artistic practice as an intimate human and cultural practice have been transformed by technological and scientific theory. How have dramaturgical processes for devising performance changed in this environment? What kinds of critical analysis and politics are suggested as a result? How does interweaving come to terms with the interrelationship of informational and cultural economies that exist on a global scale? How do questions of difference, intensity and the singular acts of performance stand their ground in the face of the imbrication of interweaving media? As the case of dumb type shows, theories of intermediality, data epistemologies and globalisation theory are now increasingly relevant in discussions of the dramaturgy of contemporary performance practice. We can see the convergence of many of these themes in dumb type’s key works: their use of mix media aesthetics and themes of globalisation are touchstones for this, as is the sensibility of in-betweenness that is being explored in many of their performances. For example, the 1989 work pH considered the conundrum of what Bruce Robbins calls the need to feel global.17 In this work, “humans [are] reduced to surrogate images” and they are disciplined by the scanning technology of global capitalism.18 PH used slide projectors and oscillating mechanical bars to replicate the mechanism of a photocopier to scan bodies and explore global capitalist iconography and themes of surveillance. Furuhashi noted in an interview cited by Katherine Mezur that: “the performers have to live in this state of terror consciousness” as the relentless machinery of the space dictated the terms of their engagement.19 Made at the height of Japan’s bubble economy and newfound material wealth from property speculation and commodity culture the performance signalled dehumanisation effects of the corporate state and suggested a profound confusion of identity. S/N established a template for using projected images in live performance: sound, image, body and text integrated to make works look somewhere between human-immersive techno-science experiments and high-end installation art. At the other end of the spectrum, the company used low-tech and anti-dramatic presentational means such as cabaret, drag performance, karaoke and direct address to the audience. The rapidly transforming sequencing of multiple streams of video projection, data noise samples and mixing of live bodies with video and lighting by Fujimoto was made possible by developments in portable computing. Talking about a sequence in OR where the performer Sunayama Noriko stands motionless while a projection of a car journey from the mountains to the sea unfolds – signifying an out-of-body experience, she writes: “These sustained car-mounted non-axial vistas unmitigated by human perceptual framing became reduced to jerky digital mosaics…. The erasure of video-as-image into ground, which simultaneously described a seamless transition from virtual to real, thus threw light onto the intermediating ‘Grey zone.’”23 OR uses new media performance to explore human experiences that lie on the edge of consciousness and human perception; the moment between life and death, the sensory politics of experience. Shikata’s descriptions of dumb type points to how an interweaving of aesthetics and politics was achieved in the combination of media “regimes” (after Klich and Scheer, above) in their performances. In all of these works there is an emphasis on velocity, fragments, the interplay between live and recorded images, and, perhaps most importantly, the audience is brought directly into a sensory experience of the work. Technologies of light and sound and the political agency of performers mix in an uncanny extension of the visual, acoustic and semiotic registers of performance and suggest a physicalized dramaturgy that transfers spectators into a state of in-betweenness. Put simply, we see as well as feel the work and our senses are transformed. One can say that dumb type’s performances propose an interwoven sensibility in their production of overlapping continuums – always ‘inter’ – making their work a constant reconsideration of life in the globalised society. Bodies, identity and culture are shown to be playful and utopian, not intrinsic, but mutable, and transformed by and into image, data, and mediatisation.